Everyone is exposed to ultraviolet (UV) radiation from the sun and other artificial sources used in industry, commerce and recreation. Emissions from the sun include light, heat and UV radiation. The sun is the strongest source of UV radiation in our environment. Small amounts of UV radiation are essential for the production of vitamin D in humans. However, over-exposure to it may lead to short and long term adverse effects on the skin, eyes and immune system. As sunlight passes through the atmosphere, all UVS and about 90% of UVB is absorbed by ozone, water vapour, oxygen and carbon dioxide. UVA is not filtered as significantly by the atmosphere. Therefore, the UV radiation reaching the Earth’s surfacee is largely composed of UVA with a smaller amount of UVB component. The higher the sun in the sky, the higher the UV radiation level. Thus UV radiation levels vary with time of the day and time of year. The closer to the equator, the UV radiation level is higher. Closer to the equator, the sun’s rays have a shorter distance to travel through the atmosphere and therefore less radiation can be absorbed. UV radiation levels are highest under cloudless skies. However, light or thin clouds have little effect in reducing exposure and may even enhance UV levels because of scattering. The higher the altitude, the UV radiation level is higher. There is less atmosphere available in higher altitudes to absorb the radiation. 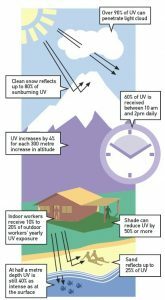 With every 1000m increase in altitude, UV radiation levels increase by around 10%. Ozone in the stratosphere absorbs some of the UV radiation that would otherwise reach the Earth’s surface. Ozone levels vary over the year and even across the day. UV radiation is reflected or scattered to varying extents by different surfaces, e.g. fresh snow can reflect as much as 80% of UV radiation, dry beach sand about 15% and sea foam about 25%.